Tadpole Nebula, IC 410, named after the shape of the gas energy form. 10 light years in size was formed 4 million years ago and is about 10 thousand light years from Earth. The shape and density will be another nursery of stars in a few thousand years by the brightness of the tadpole head that tells us that the stars will be “soon”. 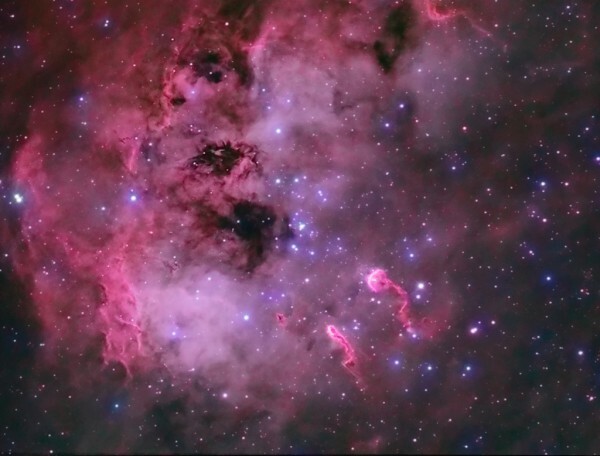 Although we need a telescope, you can see the nebula tadpole in the constellation truck (driver, charioteer, depends on how you whatever you want to call it) in the northern hemisphere, to the west, especially this February, where lies its visibility . Tadpole Nebula is sow Tau Aurigae (the star), yellow giant. If you go out into the field, to a dark area with good company I recommend you look at the stars to see this show with binoculars.